I have been seeing quite a few Clouded Yellow butterflies recently, mainly at Sabkhat Al Fasl. 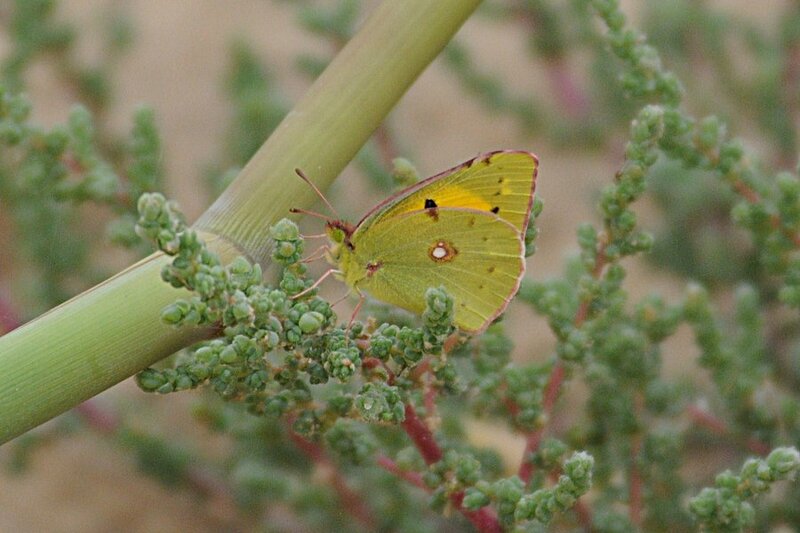 The Clouded Yellow (Colias croceus) has migrated to the oasis of Eastern Saudi Arabia where it feeds on alfalfa. It is sometimes very common but it is uncertain if it is resident in the area as it is a strong migrant. The species regularly undertakes long-distance directional movements in large numbers and this is an essential strategy for the species survival. The under-wings are a greenish-yellow colour with two silver-white spots and this is normally all that can be seen on a resting butterfly as they always rest with their wings closed. The upper-wings are deep orange-yellow with broad dark wing margins. The genus has its origins in temperate regions and is a genus of considerable antiquity. Its main centre of development is in the high mountains of Asia and North America, it extends its range to the tip of southern Africa and to Patagonia in South America.